The Astro Pneumatic 4550A Air Operated Paint Shaker w/ Oversized Clamps features a patent pending orbital drive mechanism that provides quieter and faster operation, and is designed for shaking paints and liquids. It will shake round or square containers, from a pint to a gallon container, and can accommodate larger European paint containers. The air motor makes this a versatile tool for shops working with flammable liquids, and gives it a range of uses including fabrication, wood working, cabinet and body shops, marine, industrial and aviation markets. Fully adjustable locking rubber coated clamps offer increased grip while shaking. Accommodates pints, quarts, and gallons. Shakes: 1400 cycles per minute. Air consumption: 1.35 CFM - 1.5CFM. Recommended shake time: 1.5 minutes. The item "ASTRO PNEUMATIC Air Operated Paint Shaker, auto body painting repair tool tools" is in sale since Friday, July 27, 2018. 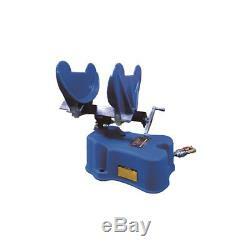 This item is in the category "eBay Motors\Automotive Tools & Supplies\Other Auto Tools & Supplies". The seller is "american_tool_outlet" and is located in Clarks Summit, Pennsylvania. This item can be shipped to United States, Canada, United Kingdom, Denmark, Romania, Slovakia, Bulgaria, Czech republic, Finland, Hungary, Latvia, Lithuania, Malta, Estonia, Australia, Greece, Portugal, Cyprus, Slovenia, Japan, China, Sweden, South Korea, Indonesia, Taiwan, South africa, Thailand, Belgium, France, Hong Kong, Ireland, Netherlands, Poland, Spain, Italy, Germany, Austria, Bahamas, Israel, Mexico, New Zealand, Philippines, Singapore, Switzerland, Norway, Saudi arabia, Ukraine, United arab emirates, Qatar, Kuwait, Bahrain, Croatia, Malaysia, Brazil, Chile, Colombia, Costa rica, Dominican republic, Panama, Trinidad and tobago, Guatemala, El salvador, Honduras, Jamaica, Viet nam, Antigua and barbuda, Aruba, Belize, Dominica, Grenada, Saint kitts and nevis, Saint lucia, Turks and caicos islands, Barbados, Bangladesh, Bermuda, Brunei darussalam, Bolivia, Ecuador, Egypt, French guiana, Guadeloupe, Iceland, Jordan, Cambodia, Cayman islands, Liechtenstein, Sri lanka, Luxembourg, Monaco, Martinique, Maldives, Nicaragua, Oman, Pakistan, Paraguay, Reunion, Uruguay.